But it's for the children!!! There is still talk of a second economic stimulus package from our federal government, this time it may be focused on helping homeowners in danger of foreclosure. Those in favor of it say it's necessary because foreclosure negatively affects children. 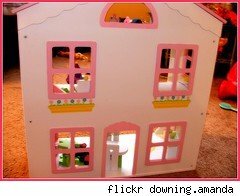 I don't disagree that a child can be upset when he or she has to move out of their home. The child may have to change schools, may have to make new friends, and may lose connections made with neighborhood kids. What I think is more upsetting, however, is having parents who put the child in such a situation. Parents should be parents. The government should not have to be the parents... the government should not be bailing out homeowners who got in over their heads. Parents should be making a conscious decision to put their child's needs first, and that includes offering the child a stable home life and place to live. Let's face it: The answer to the problem is not to have Uncle Sam come to the rescue of people who bought more house than they could afford. The real answer is to have them dig themselves out of their problems, and hopefully learn an important lesson. Our government can't bail out every problem. And it certainly isn't fair to make taxpayers foot the bill for those who are in foreclosure.